Have you ever thought you wanted whiter teeth? Often the difference between a good smile and a great smile is the shade of the teeth. Teeth whitening is one of the easiest and most transformative procedures related to cosmetic dentistry. At Pelican Landing Dental, we provide the residents of Bonita Springs, Estero, and surrounding communities with in-office or take home whitening. Teeth can become discolored for many reasons. First, many teeth simply discolor over time. Normal foods and drinks can contribute to a darkening of the tooth structure. This includes tea, wine, and coffee. Many habits can also contribute to tooth discoloration. Tobacco use is one of the most common ways that teeth become darkened. Take-home whitening is actually quite easy. The process is as follows; first, impressions will be made of your teeth and gums. These impressions will be used to fabricate stone models. Special vacuum formed clear trays are then made from the models and trimmed to a custom and comfortable fit. These custom trays will be delivered to you along with the whitening gel. This is then applied into the trays and worn at home as directed. The results can be surprising. Many teeth can become several shades brighter and truly transform a smile. The process of in-office teeth whitening is a bit different. A special material is used to protect the gum tissue. From there, a high concentrated whitening material is applied to the teeth. The results of this are incredible and can be realized in a single appointment. Often take-home whitening agents are provided for touch-ups. At Pelican Landing Dental, we use Opalescence Boost for our in-office whitening. We are often asked if there is a significant difference between the two. There are some benefits to both manners of whitening. The main benefit of over-the-counter (OTC) whitening is cost. These products can be very inexpensive. Professional whitening has several marked benefits over the OTC methods. First, the results can be much more dramatic and even - meaning the entire tooth surface is evenly whitened. This is due to the custom tray. 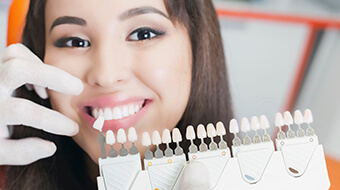 A tray that does not fit properly over the teeth often prevents an even coating of whitening material. Second, professional whitening delivers results in a significantly reduced time frame. This is due to the large differences in concentrations of the whitening agent. Many times the desired results simply cannot be realized with OTC methods. Finally, professional assistance should always be provided when whitening. Teeth that are over whitened can become translucent, which often can damage the smile permanently. Teeth that have received dental work with tooth-colored materials do not whiten the same as natural teeth. The dentist can help prevent uneven results due to this limitation.